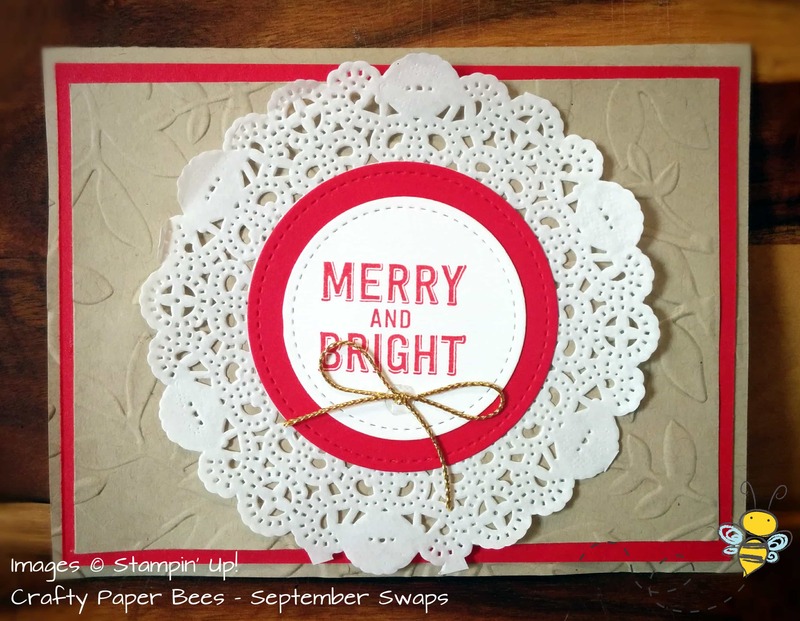 Each month at our team meetings, the Crafty Paper Bees share swap cards. These are the cards I received at the September team meeting – our theme was of course Christmas and most of these cards use stamp sets from the fabulous Holiday Catalogue. There are also some great Christmas stamp sets in the Annual Catalogue so make sure you don’t miss those! 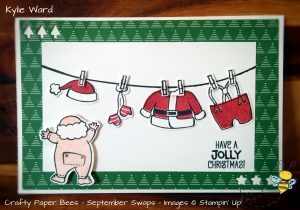 Kylie’s card features the very cute Santa’s Suit stamp set. I love all of Santa’s clothes hanging on the clothes line. There are matching famelits for this stamp set which makes cutting out all the clothes so much easier, and of course it’s available with a 10% discount if you order the stamp set and framelits in a bundle. 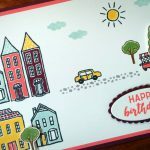 This next card uses the lovely new Layered Leaves 3D dynamic embossing folder and is layered with a Delicate White Doily and circles cut using the Stitched Shapes Framelits. These items are all from the Annual Catalogue – you can create these cards all year round so you’ll be super organised when Christmas time rolls around. Similarly, this next card uses Santa’s Sleigh and matching Santa’s Sleigh Thinlits Dies from the Annual Catalogue. 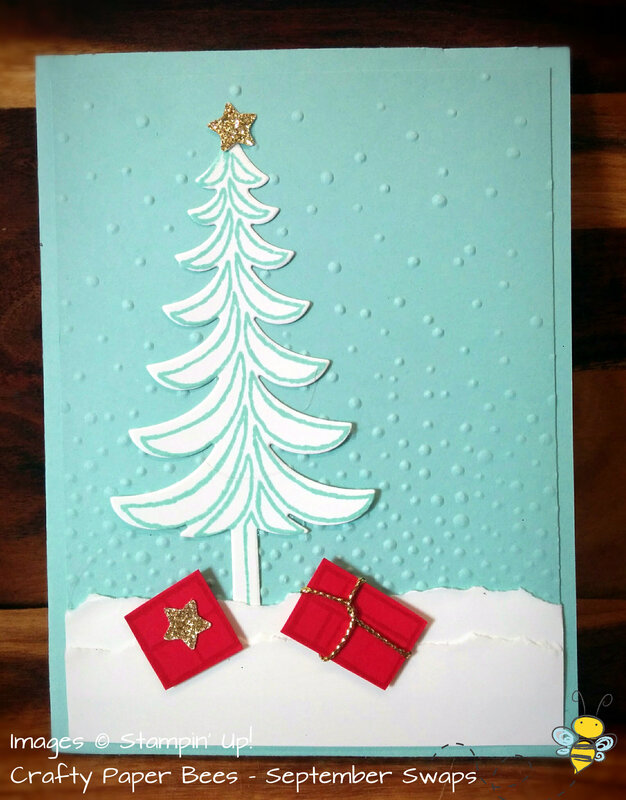 The Whisper White cardstock at the bottom of this card is torn which gives the card great texture and creates a layered snow look – perfectly paired with the Softly Falling embossing folder. I love the little stars cut out of gold glimmer paper, one on the tree and one on the present. And the gold ribbon around the present also adds a lovely touch. These elements are popped up on Dimensionals which helps give the card depth. 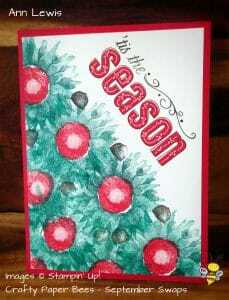 Ann’s card uses the new Painted Harvest stamp set from the Holiday Catalogue – not just for Thanksgiving! Here the “sunflower” image is used to create a Christmas tree with red baubles! Very creative and versatile. Kellie has made a rosette which can be hung from the Christmas tree. She’s also used the Gold glimmer paper and glimmer it certainly does. 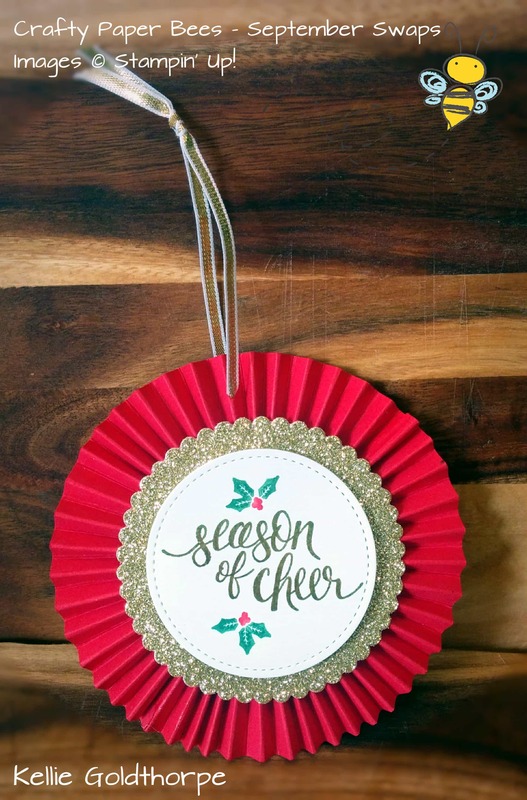 The sentiment from her rosette is from the Watercolor Christmas stamp set. 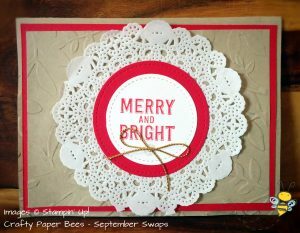 This stamp set coordinates with the Watercolor Christmas Project Kit which makes 20 cards (5 of each 4 designs). This kit is a great way to get lots of Christmas cards made as most of the work has been done for you – the kit includes card bases, envelopes with gold foil liners, printed die-cut accents, gold mini sequin trim and more! 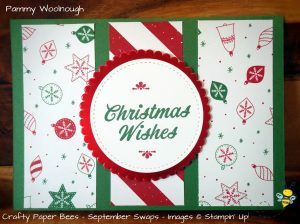 Pammy’s card uses the Be Merry Designer Series Paper and matching Merry Mistletoe stamp set, from the Annual Catalogue. 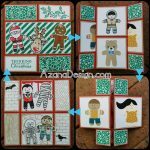 This set has cute little hand-drawn patterns in classic Christmas colours. 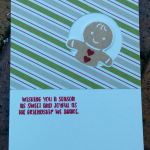 Wanda’s card uses the Better Together stamp set, which is a must have stamp set in my opinion – it covers most occasions which makes it so versatile and has coordinating phrases which can be used on the inside as well as the front of the card. Her card also uses the Flourish Thinlits in a gorgous way to create a Christmas poinsettia with red berries on the stems. There’s even another poinsettia on the inside of the card – along with the matching Christmas greeting from the stamp set. And lastly, Fran’s card uses the Star of Light stamp set and matching Starlight Thinlits Dies. 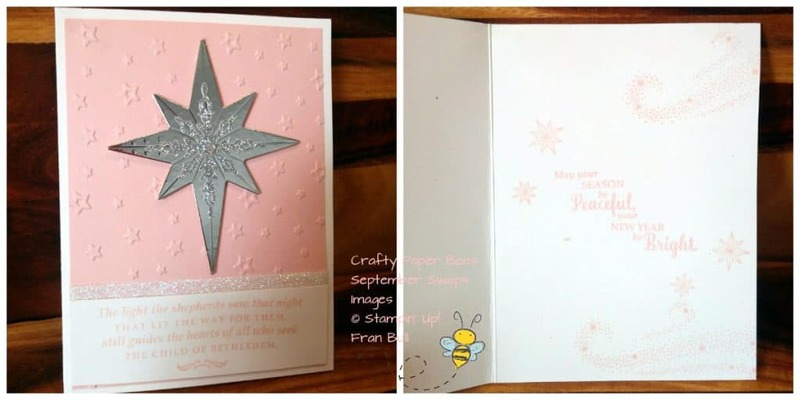 The silver foil paper and glimmer paper used to make the central stars really make the card pop along with the beautiful swirly stardust on the inside of the card. 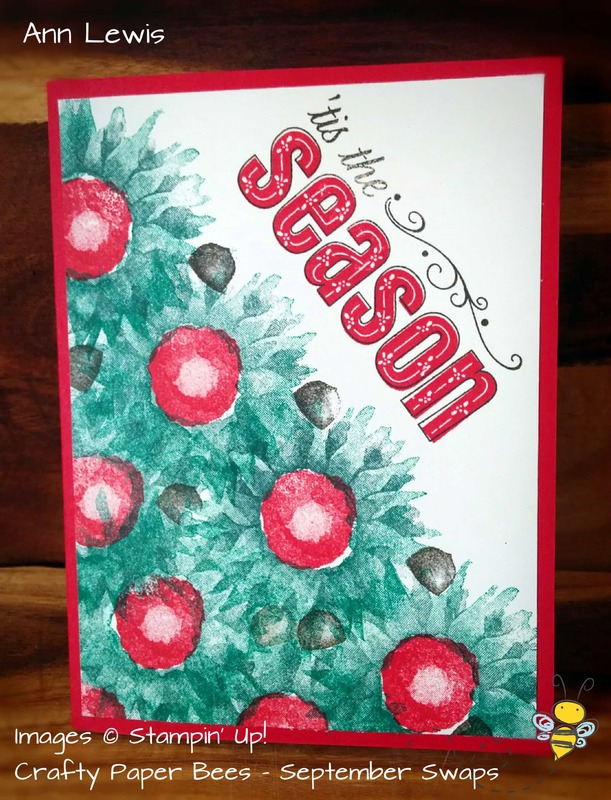 I’ve been making a lot of cards recently for OnStage Live in Salt Lake City and another stamping event I attended so I’ll share those shortly, along with my Christmas card swap for the team meeting.